With the new school year on the horizon in a few months, anxiety is sure to be running high for soon to be students. Teachers are busy with the end of the school year and will be planning every detail of the first few months of the new year that lies ahead. Parents and young children are nervously awaiting an important transition in their lives to preschool or kindergarten. For many children their first day of school is also the first time that they will be leaving their caregiver for an extended period of time. Many children may not know what expect at school, how to interact with others, or understand that there are rules to be followed. Most importantly, children may experience a wide range of emotions from excitement to fear that can often be overwhelming for them. Preschool and kindergarten teachers have the sometimes difficult role of helping children (and often parents) with the adjustment to school. It’s a multi-faceted task, and not a simple one. However, one thing that teachers can do to help ease children into the transition to school is to read books to their students on this very topic. Children’s books not only provide an important opportunity to strengthen emergent literacy, but grant teachers with a foundation to initiate discussions about such things as classroom procedures and rules, teacher and student expectations, and feelings that children might be experiencing. 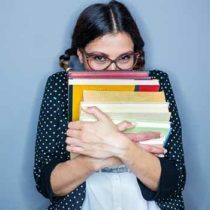 With the aid of some well selected books for the first few weeks of school, a teacher can help transform an often nerve-wracking experience into a pleasant one. Here are a few good books that could easily fit into a first month lesson plan for a preschool or kindergarten teacher. David Goes to School by David Shannon is a short, but humorous story that is sure to be a hit with early childhood students. David is a lovable character who often finds himself in “trouble” with his teacher, who must constantly remind him of what to do and not to do in school – “David, raise your hand” or “Don’t chew gum in class”. Aside from being an enjoyable book for circle time, David Goes to School can lighten the mood for the discussion of: The Classroom Rules, which is one that is sure to take place early in the school year. School Bus by Donald Crews is another great beginning-of-year book. For some children, riding a school bus for the first time can be a scary experience. This book gives the ins and outs of what a school bus does during the course of a day. Children will be able to relate to this story, and it will help them become accustomed to a new procedure in their life. School Bus is also a nice book that can feed into another project or lesson such as a school bus art and craft project, or a discussion on transportation. Maisy Goes to Preschool by Lucy Cousins tells of Maisy’s first experiences as a new preschooler. She paints, listens to stories, meets friends, and has a snack. It is a fabulous book to familiarize children with the routine things that they may encounter on a day-to-day basis, which will not only help lessen anxiety, but help children know what is to be expected in school. Maisy Goes to Preschool also makes school seem like a ton of fun! There is certainly no shortage of books that deal with the emotional side of transitioning to preschool or kindergarten, but Franklin Goes to School by Paulette Bourgeois and Brenda Clark and Llama Llama Misses Mama by Anna Dewdney are two with strong, likable characters that children will adore. Both stories portray the first day feelings and experiences that a child will likely encounter. It’s often comforting to children to identify with these characters and see that everything turns outs O.K. for them in the end. Following these stories, teachers can begin a much needed discussion on the feelings associated with leaving caregivers for the first time and going to school. Teachers may want to pose such questions as: “How did you feel when you arrived at school on the first day?” or “What feelings did the characters in these stories have about going to school?” Teachers may even want to take a poll of their students’ feelings to help them understand that what that they are experiencing is shared by many others in the classroom. New experiences can be difficult, especially for children. With the assistance of several children’s books, teachers can make the transition to preschool and kindergarten easier for their students, which will, in turn, facilitate the ultimate goal of improving student learning. Marissa Kiepert Truong, Ph.D. is an educational psychologist and mom to a toddler girl. She writes about emergent literacy, children’s books, and child development on her blog, Land of Once Upon a Time. You can connect with Dr. Kiepert Truong on Facebook and Twitter.